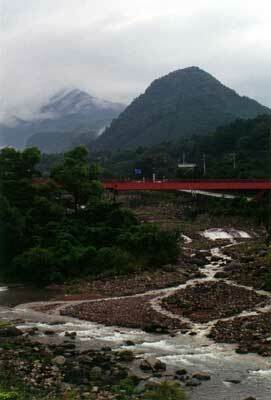 Anne took me there on a 2-day trip, as it is a long way from Tokyo and we also wanted to see Edo Mura. We dropped our luggage at the youth hostel (that is, once we had found it, hidden near the river) and made for the first group of temples. It had been raining for several days so the air was still wet, and mist was clinging to the tree-covered mountainsides It gave the whole place, which is beautifully nested between bushy peaks, a very appropriate feel. I expected a samurai to materialize out of the fog any moment. 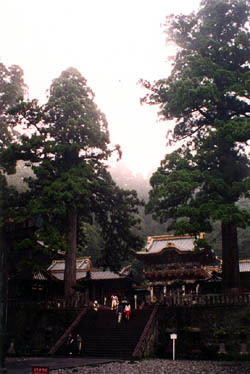 The mausoleum complex is huge and includes many very intricate buildings including a sacred stable, a drum tower, and naturally, the Toshogu shrine that is the heart of Nikko. 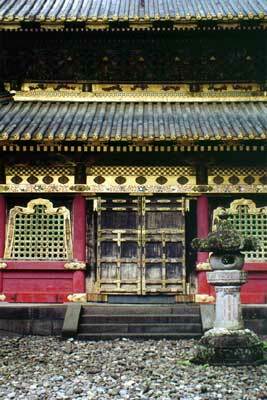 This shrine is the mausoleum of Ieyasu Tokugawa, the first Tokugawa shogun. He initiated a policy that closed off Japan from the rest of the world for 200 years and allowed it to flourish on all levels. In the midst of this superhuman splendor (if you saw the size of the trees and the contribution of mist and moss you'd know what I mean) one finds very human touches. The Sacred Stable for instance is famous for its carving of the Sanzarukun: Kikazaru, Wazaru and Mizaru. You probably know them as the three monkeys: Hear No Evil, Speak No Evil and See No Evil. 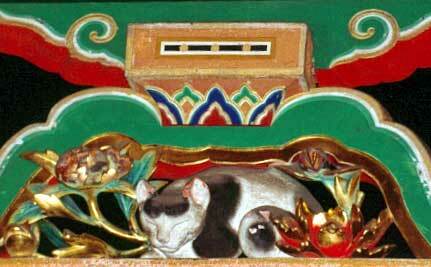 The Sakshita-mon gate sports a sculpted sleeping cat. 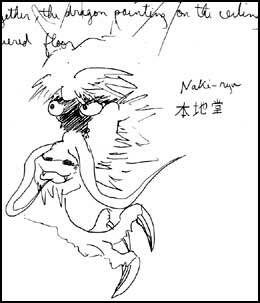 Yet the most amazing thing in the complex is Naki-ryu, the Weeping Dragon. 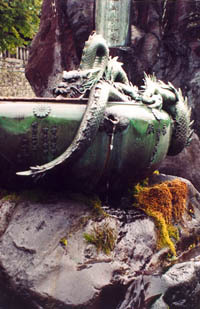 It is a room with a large dragon painted on the ceiling, and a floor lacquered in black. 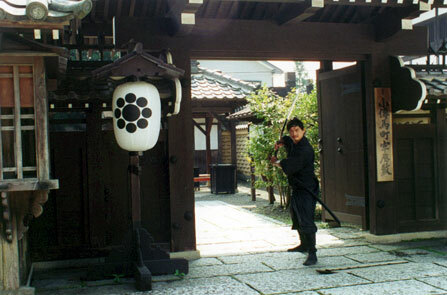 A monk stands there with clappers and hits them together hard: when the acute sound echoes through the room one distinctly sees drops of water appearing on the floor, having fallen from the dragon above. 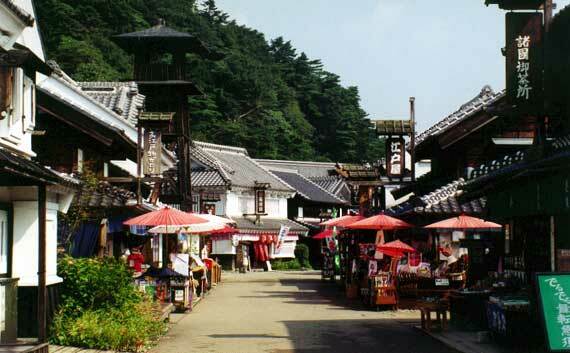 Our stay was so short that we didn't get to explore more distant shrines; we walked around the village instead. 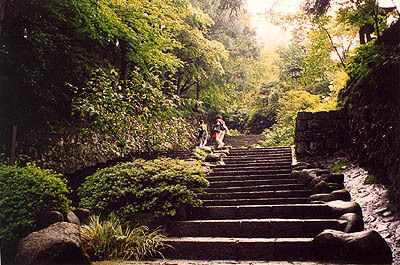 Nikko village is absolutely delightful, tiny yet full of life, hours away from the city yet equipped with the latest facilities aside from the traditional ones. I will be back at that youth hostel, for a longer stay. "Yes, we're the only gaijin." Indeed, not one other foreigner showed up the whole day. We were at the gate at opening time, and so got to enjoy the morning welcome: actors in Edo dress, lined up on either side of the entrance, bowing to us with a resounding "O-hayo gozaimasu!" while a drum sounded. 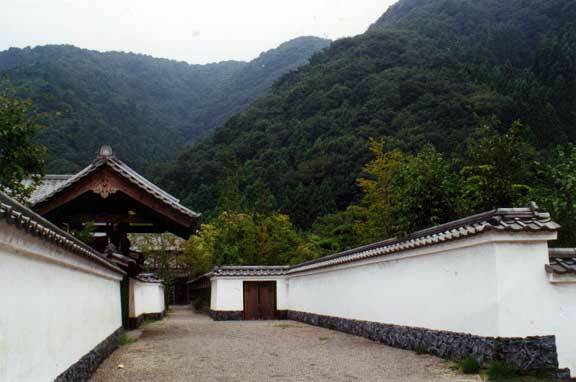 Edo Mura literally means "Edo village", and is a reconstruction of a town of the Edo period (17th to 19th c.), often used as a film set. we were therefore plunged in an atmosphere of shogun, samurai, court ladies and above all ninjas! They're what we were really after. We watched a show of "water magic", a traditional theater art, and spent the rest of the day in the ninja shows. A particularly good-looking one with manga-length hair caught our eye, and we were all a-twitter when he winked! 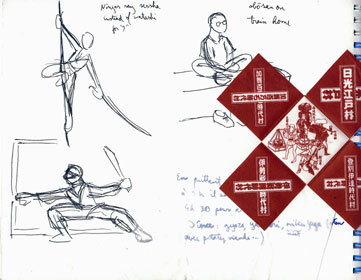 What hit me about ninjas is the rectilinear quality of their movements. They're all bent on efficiency, incredibly fast, and deadly accurate. I feel now the difference with Kung Fu, where the movements are deliberately curved to obtain something as beautiful as it is efficient. The shows were truly well studied, with an occasional stroboscopic light to visually deconstruct the action for us. 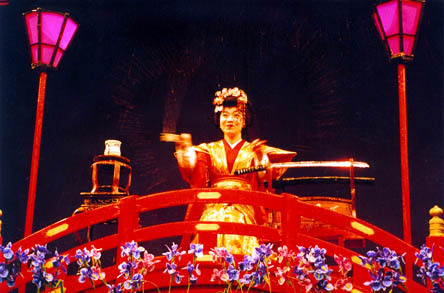 One of the shows was the story of the monk who founded the Nichiren Buddhist sect. I didn't understand a thing, but that allowed me to focus my attention on the movements, the costumes and acting. 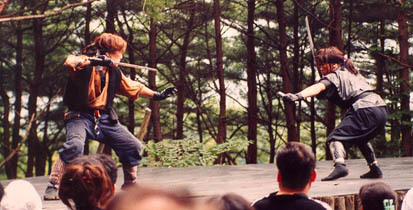 It isn't possible to evaluate a Japanese play by Western standards: Japanese standards are too different. For instance,they have a different, more "roaring" way to raise their voices in anger, in a way that would sound funny to the unsuspecting Western audience [I write this well before the manga craze seizes the rest of the world, so that by now everybody's more or les accustomed to this]. As for the public, it reacts with such enthusiasm that for a moment I thought it was participating in the show. 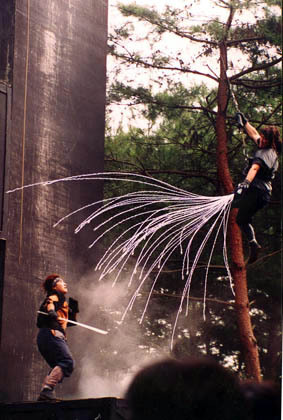 The third show was in open air, or rather, in the air: an aerial battle. 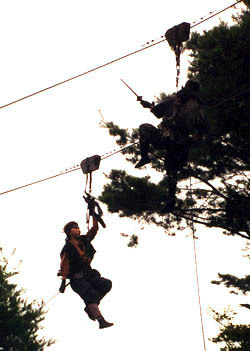 The ninjas slid along suspension cables that were covered by hundreds of dragonflies: flights of the crystalline creatures preceded every one of their moves. The return journey was exhaustingly long, but Okasan prepared us a wonderful dinner. After eating we sat down for a charming moment: she wanted to teach me to make a paper crane, "so I could teach the children back home". It is said that if you make 1000 paper cranes, your body will heal entirely.